I went "squeeeeeeee! 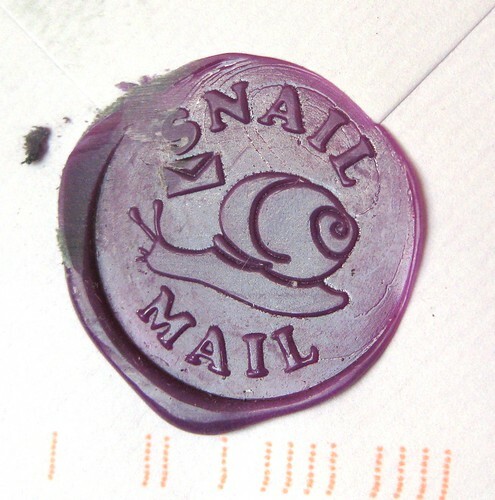 ", overwhelmed with the cuteness, when I saw this awesome wax seal on a letter. Lovely, meta, fabulous. wow that is mega fabulous or is it foo fa lah ? either way it is just too for words . It is amazing that wax ceal made it through the postal system in tact. I have just issued a large squeeeeee myself! Awesome wax seal! So Cute. So Fun! Love it. Ahoy there Ilona! I'm your 101st follower. If I look a little similar to someone else I must say that the resemblance is purely coincidental. Yes yes, some say I am but a paper mache doll but that doesn't make me any less fun than my maxi-Counterpart. Violet - I have no idea. It came to me on a letter, and I don't where the sender got it. I'm going to Google 'til I can't Google any more! :) I'll report back if I find a source!